If you’ve been watching our dev update videos then you’ll know all about FACEIT. If you don’t… then you really should subscribe to us. 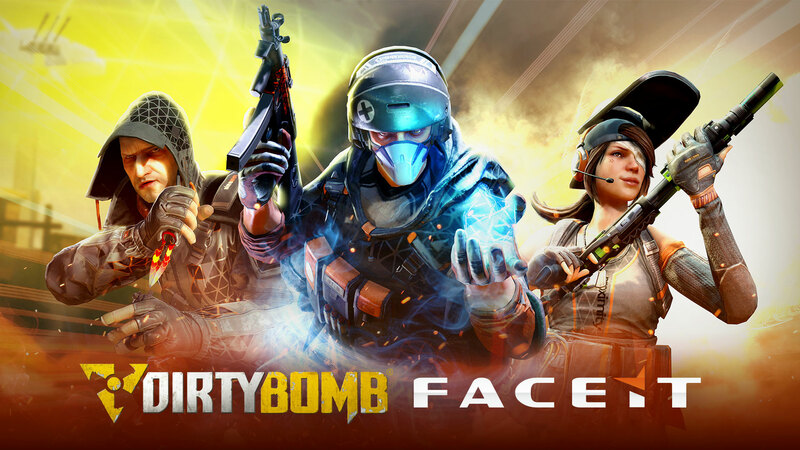 FACEIT is the top system for you to play competitively online in a number of games, and by working closely with their team, we’ve now added Dirty Bomb to their roster. Once you’ve made a FACEIT account you’ll be able to join community hubs to play with and against friends, and find new players to join as you hone your skills in the premier competitive environment. Especially for FACEIT we’ve implemented Drafting which includes Merc bans and prevents duplicate Mercs on the same team.. This means you’re going to have to think hard about what Mercs you want to ban, taking them away from yourselves and your opponents, and which ones to take into a match. If you’re missing a few Mercs and are worried you may get banned out, don’t worry! When you play on FACEIT any Merc can be selected, regardless of if you’ve unlocked them or not. Want to earn shiny things for playing with FACEIT? WHO DOESN’T!! And we’re not going to disappoint. We’ve carefully crafted FACEIT Weapon Skins for each and every Primary and Secondary weapon which you can pick up in the FACEIT Store with FACEIT points. Play well, earn points and get exclusive content..
Tasty.. There’s also an exclusive FACEIT Trinket available for you to pick up if you really want to show off your competitive prowess..
More of FACEIT’s features will be added over time allowing us to run our own tournaments and more! So keep an eye out for official Dirty Bomb hubs and announcements of when tournaments will be kicking off! Want to chat about it some more? Head on over to the official forums, or check out our social channels.